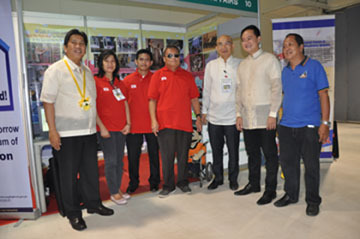 To promote awareness on disability programs, the NCDA recently participated in the Kabisig Government Expo and Trade Fair 2013 held at the Megatrade Hall, SM Megamall, Mandaluyong City. The NCDA Exhibit dubbed as “Disability Information Booth featured services and accomplishments, profiles, mission and vision and at the same time encourage exhibitors/participants to make their programs responsive to persons with disabilities. Around 67 government organizations (GOs) , government owned controlled corporations (GOCCs), Local Government Units (LGUs) and Government Financial Institutions (GFIs) joined the Trade Fair. In the photo are: Secretary Sonny Coloma (extreme left) of the Philippine Information Agency and Presidential Communication Operations Office, Deputy Executive Director Mateo A. Lee, Jr. (center) of the National Council on Disability Affairs (NCDA), Chairman Daniel C. Guillen (3rd from the right) of the Kabisig People’s Movement, Councilor Alex Santa Maria (2nd from right), Mandaluyong City.